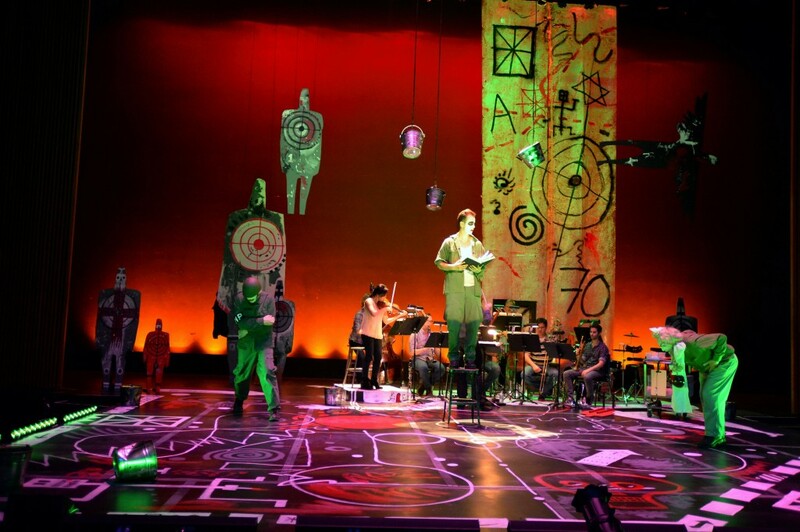 Way back in the 1960s, I played the speaking part of the Soldier in an English-language presentation of Stravinsky’s The Soldier’s Tale (L’Histoire du soldat) with its folksy Russian narrative written by Charles-Ferdinand Ramuz. I cannot recall the translation we used, but the concert was blessed with a brilliant USC student musical ensemble headed by Leonard Stein. I was quite young and it had not yet occurred to me that the text might be naive and stupid, but I was aware that Stravinsky himself did not care for it and preferred the work when played as a suite without narration — or without dancing, for that matter. However, the piece inspires almost any sort of dramatic or dance treatment. There is even an animated film with a narration by Max von Sydow. The Ensemble. Photo by Keith Ian Polakoff. The now despised Ramuz text involves a Faustian bargain in which a soldier on leave is waylaid by the Devil and tricked into swapping his violin (his soul, of course) for a book that foresees the future and promises immense material gain. Kurt Vonnegut hated this text so much that he junked it entirely for An American Soldier’s Tale, a didactic (or should I say Brechtian?) drama about the execution of Private Eddie Slovik in WW II. Ironically, the Ramuz story, so much out of fashion now, is actually used as the basis for another newer work, the Wynton Marsalis/Stanley Crouch, A Fiddler’s Tale, in which we are given another Faustian bargain between the Devil (here called Bubba Z. Beals, or BZB for Beelzebub) and a violinist who sells out for gold-record success. One would think that the most logical pairing for the Marsalis work would be with the original Stravinsky/Ramuz piece — but if that had been the case, as it has been elsewhere (including recently in San Diego), we would never have had the opportunity to see the Stravinsky/Vonnegut piece as presented so intriguingly by the Long Beach Opera. I personally find Vonnegut’s text awfully heavy handed and his need to teach us a thing or two embarrassing, but with the stage direction of David Schweizer, the striking and very Russian looking set designs of Danila Korogodsky, and the deftly grotesque performances of the three principals — Kevin Reich as Private Eddie Slovik, Tony Abatemarco as the General, and Mark Bringelson as a Military Policeman — the show strikes exactly the right tone. It’s a bit of commedia dell’arte inflected by expressionism. With all the exaggerated makeup and black-comedy clownish antics, the proceedings have the air of a pre-WW II German cabaret. It’s great fun as well as a little scary, but the History Channel lecture I could do without. “The American Soldier’s Tale.” Photo by Keith Ian Polakoff. To me Igor Stravinsky is the towering genius of 20th-century music and “L’Historie” one of his wittiest neoclassical scores. I felt the fine efforts of the musical ensemble conducted by Kyrstof Van Grysperre were overwhelmed by everything else going on and that the music had been adjusted here and there to accommodate the speaking of more text than I wanted to hear. But Stravinsky was a man of the theater, and his brilliant score will live on by itself whether or not it is used as an accompaniment to a stage entertainment. 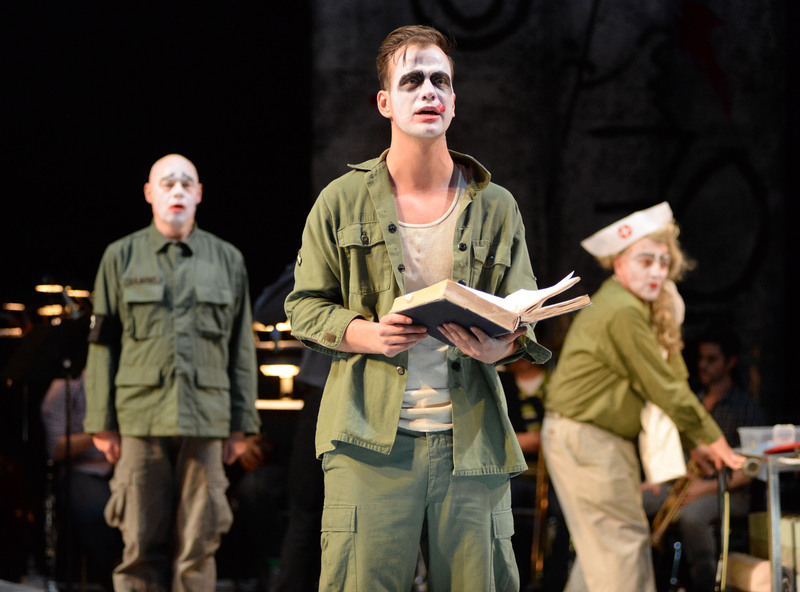 The LBO production was diverting and clever — and God knows, we learned all about how Private Eddie Slovik was the only American soldier to be courtmartialed and executed for desertion since the American Civil war. 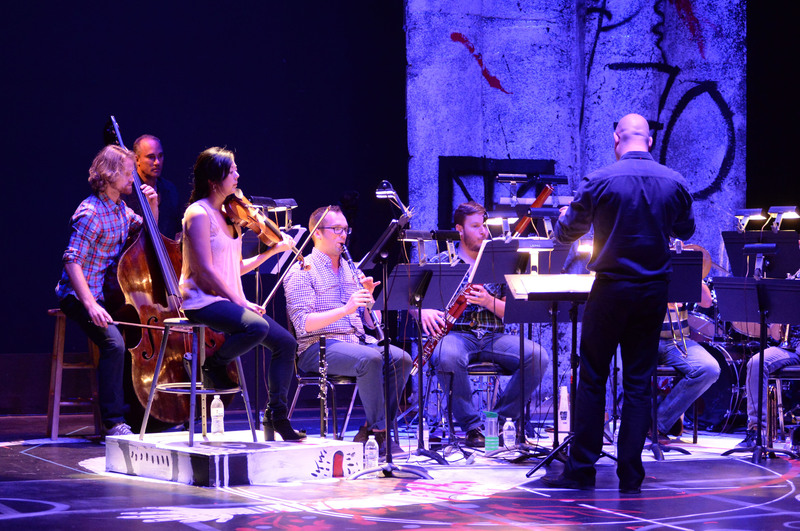 With music by Wynton Marsalis and a text by Stanley Couch (adapted by Marsalis), A Fiddler’s Tale is an amazing homage to Stravinsky’s “L’Historie,” quoting it extensively and paralleling all its moods and modes, chorales and popular dances. 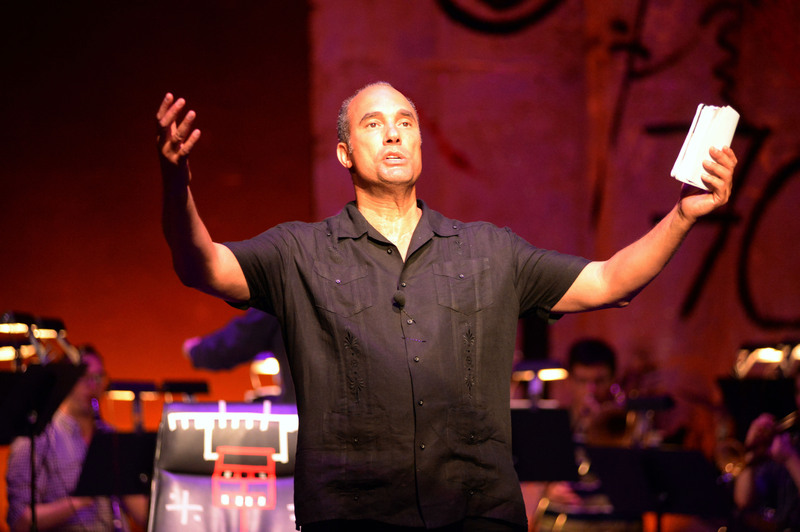 One narrator/dancer/performer dominates the piece — in this case the dynamic and larger-than-life Roger Guenveur Smith. He generated plenty of excitement and animal magnetism: all the ladies I talked to were swooning. But, as in the case of the Stravinsky piece, I felt the music was swamped by the theatrical elements. To say his performance was a tour de force would be an understatement. But the story is a simple as Ramuz and his soldier: an ambitious young lady who sells her soul for success in the music industry. Roger Guenveur Smith. Photo by Keith Ian Polakoff. As the San Diego Opera struggles for survival and other companies go extinct, we can all learn a little about fund-raising from the LBO’s Andreas Mitisek. Saturday’s matinee performance was delayed by a full 45 minutes because of a missing trumpet player allegedly stuck in traffic on the 405. Why not auction off the set to kill some time? Why not have the musicians play some extracts sans trumpet? Mitisek, forever spontaneous and amusing, gave us some extra music and earned quite a bit of money for the company as he auctioned off Korogodsky’s set, piece by piece. All in all, a very entertaining afternoon. The things that went wrong only made it better. And here are some people who matter!